The latest scandal to taint college athletics hit sports far from the spotlight and exposed a seamy side door into some of the nation's elite universities: coaches taking bribes to recruit non-athletes and help them ease past tough admissions policies. The indictments expose how coaches and schools use lists of "designated recruits" to bypass normal admissions requirements, and some of the financial hurdles "non-revenue" sports may face even within big athletic departments. In several instances, indicted coaches suggested they spent some of the money on their programs, not themselves. David Ridpath, a former Division I athletic compliance officer who is now associate professor of sports management at Ohio University, said this type of fraud in an athletic department would be both easy to conceal and easy to stop with appropriate monitoring. "By design it went to Olympics sports where there is generally less scrutiny, but simply having a policy that anyone associated with athletics must be tracked including managers, etc., would certainly at least raise a red flag," Ridpath said in an email to The Associated Press. Most NCAA rules that regulate recruiting are designed to prevent schools and coaches from giving improper benefits and enticements to athletes. Federal officials say "Operation Varsity Blues" uncovered parents or college placement services paying coaches to help non-athlete children get into elite schools by falsifying athletic credentials and claiming they were being recruited to play sports. The schools involved will wait to hear from the NCAA about possible infractions and penalties, and the bribery allegations provide an interesting wrinkle: The schools and coaches didn't game the admissions process to gain an advantage on the field. But the NCAA does have rules regarding ethical conduct by coaches. "The charges brought forth today are troubling and should be a concern for all of higher education," the NCAA said in a statement. "We are looking into these allegations to determine the extent to which NCAA rules may have been violated." Private and public schools with even the most rigorous academic entry standards allow leeway for student-athletes to keep their teams competitive. Coaches provide school admissions officers, often through the athletic compliance department, with lists of "designated recruits," even in cases where they might only receive a partial scholarship or limited financial aid. In most of the sports involved in this case, few athletes receive full scholarships. It's those "designated recruit" lists that opened a pathway into school for students who would never compete. Bracky Brett, senior associate athletic director for compliance at Mississippi State, said at his school coaches have no direct contact with admissions and work through compliance. He said while Mississippi State has no special admission standards for athletes, compliance does vet recruits. "The NCAA eligibility center is part of our checks and balances as well because if they are a legitimate student-athlete they're registered with the eligibility center. That's the first thing we check," Brett said. In one case in the indictment, the bribe came in cash paid to a coach in a hotel parking lot. In others, bribes were paid as donations to charities or businesses the coaches controlled, or in trading stock shares. In at least two cases, it's unclear whether the coaches kept the money or spent it to help fund their sports programs. According to the federal indictments unsealed Tuesday, former Yale soccer coach Rudy Meredith put a student who didn't play soccer on a school list of recruits, doctored her supporting portfolio to indicate she was a player, and later accepted $400,000 from the head of a college placement company. "There are what we called 'hooked' students and 'unhooked' students," he said. "Hooked students have some kind of advantage, either from an underrepresented geographic area, a recruited athlete, son or daughter of an alumus or alumna or an underrepresented ethnic group. Athletes certainly enjoy preferential treatment in the admissions process." Texas law requires the Austin campus to accept in-state students who have graduated within the top 6 percent of their high school class. That leaves everyone else, especially students from out of state, competing for the final spots. Federal officials allege Texas men's tennis coach Michael Center took bribes in excess of $90,000 — including $60,000 in cash in a handoff outside an Austin hotel— to help a student get into school in 2015 by designating him as a recruit and sending him a letter for a "books" scholarship. Once enrolled, the student left the team and renounced his book scholarship. 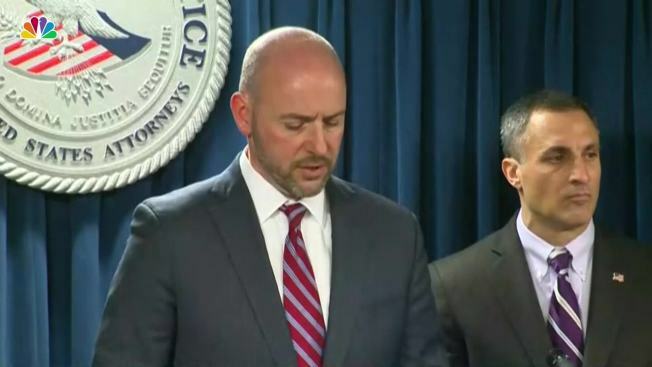 Other coaches indicted were Stanford sailing coach John Vandemoer, former Georgetown tennis coach Gordie Ernst, UCLA men's soccer coach Jorge Salcedo and Wake Forest volleyball coach William Ferguson. At Southern California, former women's soccer coach Ali Khosroshahin, former women's soccer assistant coach Laura Janke, water polo coach Jovan Vavic and Senior Associate Athletic Director Donna Heinel also were charged. Georgetown said Ernst has not coached there since December 2017 after an internal investigation found he violated admissions rules. The school said it now audits its rosters to see if students who were recruited as athletes are still playing. Most of the schools quickly distanced themselves from the bribery schemes by firing or putting the involved coaches on leave and portraying the institutions and regular students who were denied entry as the victims. "Integrity in admissions is vital to the academic and ethical standards of our university," the University of Texas said. "Based on what we know at present, we believe this was an isolated incident in 2015 that involved one coach and no other university employees or officers." AP Sports Writers Pat Eaton-Robb and Ralph D. Russo contributed to this report.